You will be asked to lie down. The health care provider will clean several areas on your arms, legs, and chest, and then will attach small patches called electrodes to those areas. It may be necessary to shave or clip some hair so the patches stick to the skin. The number of patches used may vary. The patches are connected by wires to a machine that turns the heart's electrical signals into wavy lines, which are often printed on paper. The doctor reviews the test results. You will need to remain still during the procedure. The provider may also ask you to hold your breath for a few seconds as the test is being done. It is important to be relaxed and warm during an ECG recording because any movement, including shivering, can alter the results. Sometimes this test is done while you are exercising or under light stress to look for changes in the heart. This type of ECG is often called a stress test. Make sure your provider knows about all the medicines you are taking. Some drugs can interfere with test results. DO NOT exercise or drink cold water immediately before an ECG because these actions may cause false results. An ECG is painless. No electricity is sent through the body. The electrodes may feel cold when first applied. In rare cases, some people may develop a rash or irritation where the patches were placed. Pericarditis is a condition in which the sac-like covering around the heart (pericardium) becomes inflamed. The accuracy of the ECG depends on the condition being tested. A heart problem may not always show up on the ECG. Some heart conditions never produce any specific ECG changes. Brady WJ, Harrigan RA, Chan TC. Basic electrocardiographic techniques. In: Roberts JR, Custalow CB, Thomsen TW, eds. Roberts and Hedges' Clinical Procedures in Emergency Medicine and Acute Care. 7th ed. Philadelphia, PA: Elsevier; 2019:chap 14. Ganz L. Electrocardiography. In: Goldman L, Schafer AI, eds. Goldman-Cecil Medicine. 25th ed. Philadelphia, PA: Elsevier Saunders; 2016:chap 54. Mirvis DM, Goldberger AL. Electrocardiography. In: Zipes DP, Libby P, Bonow RO, Mann DL, Tomaselli GF, Braunwald E, eds. Braunwald's Heart Disease: A Textbook of Cardiovascular Medicine. 11th ed. Philadelphia, PA: Elsevier; 2019:chap 12. The electrocardiogram (ECG) is used extensively in the diagnosis of heart disease, from congenital heart disease in infants to myocardial infarction and myocarditis in adults. 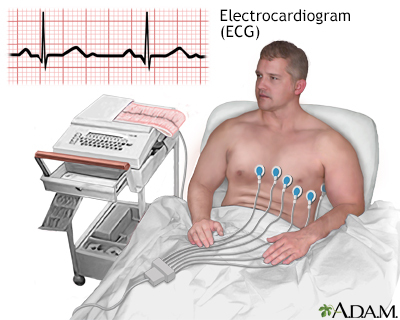 Several different types of electrocardiogram exist. This picture shows an ECG (electrocardiogram, EKG) of a person with an abnormal rhythm (arrhythmia) called an atrioventricular (AV) block. P waves show that the top of the heart received electrical activity. 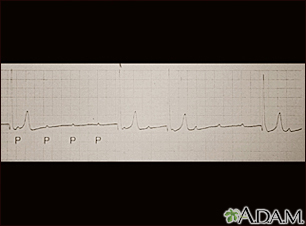 Each P wave is usually followed by the tall (QRS) waves. QRS waves reflect the electrical activity that causes the heart to contract. When a P wave is present and not followed by a QRS wave (and heart contraction), there is an atrioventricular block, and a very slow pulse (bradycardia). 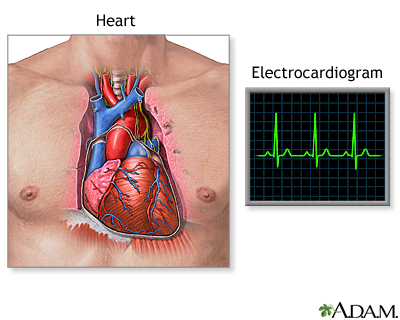 An electrocardiogram is a test that measures the electrical activity of the heart. This includes the rate and regularity of beats as well as the size and position of the chambers, any damage to the heart, and effects of drugs or devices to regulate the heart. 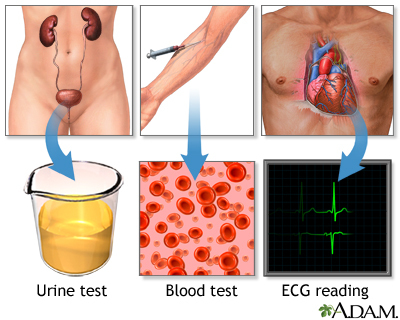 An ECG is very useful in determining whether a person has heart disease. 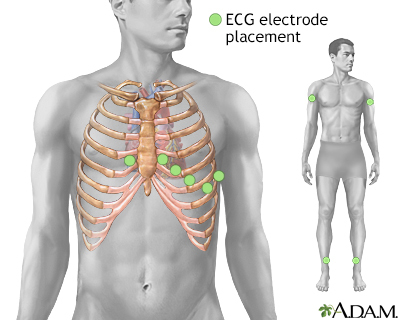 During an ECG electrodes are affixed to each arm and leg and to the chest.